The project is devoted to development of conditions for support people-to-people cooperation between Finnish and Russian citizens by means of simplifying access to governmental social services of neighboring country such as customs, visa obtainment, traffic laws, etc., in particular for people, who are not wholly guarded by any kind of legal entity, for instance, a travel agency. The easy access to governmental social services provides an opportunity for people to freely travel in program region, initiate and develop contacts in numerous fields of activities, such as business, cultural exchange, or education. In pr evious years cross-border cooperation between Finland and Russian has been flourishing and developing. In 2009 the number of arrivals of Russians to Finland topped 457 000 people. 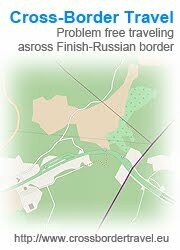 About 50 000 Russian-speaking people live in Finland permanently, and over 100 000 of Russian citizens work or study there. Finnish citizen also like to visit St. Petersburg; this region is attractive for Finnish businessmen as well. However, both Russian and Finnish citizens frequently do not feel themselves safe and free due to differences in legal formalities, documentation flow, etc. : people often misinterpret laws and regulations of another country, which lead to curious incidents and misfortunes. Russian and Finnish authorities responsible for support of foreigners have a lack of tools to support Finnish foreigners in Russia and Russian foreigners in Finland. Only general purpose formal procedures for all kind foreigners exist. At the moment there are only unsystematic information sources about social services and formal procedures in the neighboring country. Also systematical approach to governmental social service access organization is highly demanded in Russia, and in St. Petersburg in particular, therefore, creation of relevant approaches and software tools has been included in St. Petersburg government plans. 19.04.2013: Final project seminar On 19th April the last project seminar will be arranged in Sokos Olympia Garden. Place: St. Petersburg, Sokos Olympia Garden, Bataiskiy per., 3 “A”. Date: 19.04.2013Please see the agenda attached. 20.03.2013: Last Project JMG meeting in Finland. On 20th March 2013 the last JMG meeting will be arranged in Lappeenranta.